LBackup uses hard-links to reduce the required storage space of backup set(s). This section provides a real world example of disk usage savings which is possible via the use of hard links with LBackup. The image below shows that each of the completed backup snapshots within this backup set consume a minimum of 300GB storage. However, if we run the 'du' (disk usage) command on the entire backup set (as shown in this next image) we are able to determine that the physical storage requirements for the entire backup set (all backup snap shots, prior to file system de-duplication or compression) is close to 900GB. 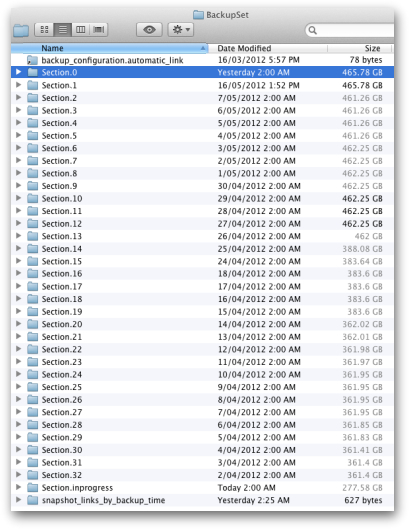 It is clear from the screen capture above that each snapshot requires a minimum of 300GB of storage space. Therefore with over 30 snapshots in this backup set, the hard linking between snapshots has saved more than 9,000 GB of storage space. Using the 'du' command it is also possible to calculate the additional disk usage required per snapshot. The first instance of the 'du' command shown in the example image below reveals the most recent snapshot uses a total of more than 400GB of storage space. However, the second instance of the 'du' command shown reveals that 19GB of additional storage space was required to store the most recently completed snapshot. Thus in this situation a saving of more than 400GB of storage space was saved via the hard linking of the most recent LBackup snapshot. Files having multiple hard links are counted (and displayed) a single time per du execution. Directories having multiple hard links (typically Time Machine backups) are counted a single time per du execution. Restoring files from backup (This page contains important information relating to hard links).